I know a guy who's tough, but sweet. He's so fine, he can't be beat. I want candy, I want candy! This summer there seems to be an abundance of bright, candy-colored goodness available for your nails. 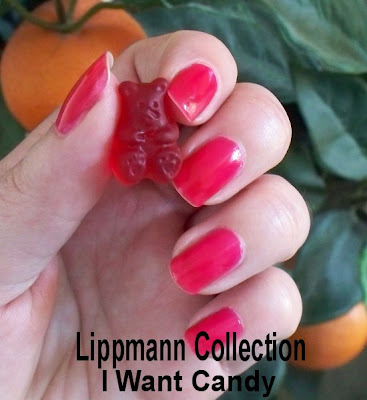 My favorite polish of the bunch is Lippmann Collection's I Want Candy, which was actually release last Fall, but is still readily available wherever Lippmann Collection polishes are sold. It's got a beautiful watermelon pink jelly finish. The jelly finish has the translucency of a sheer, but a buildable hue that you can increase the saturation level of by layering. I prefer my jelly polishes to reach full saturation like a cube of Jell-O or in this case, a Fruit Jammers gummi bear, so I used 3 thicker coats of color before a layer of Poshe rapid drying top coat. The OPI Mod About brights collection features six creme finished shades that capture the fun and edginess of the mod 'invasion' of the 60s. There is a red, pink, orange, yellow, but the two that caught my eye and had to come home with me are the blue and the green. 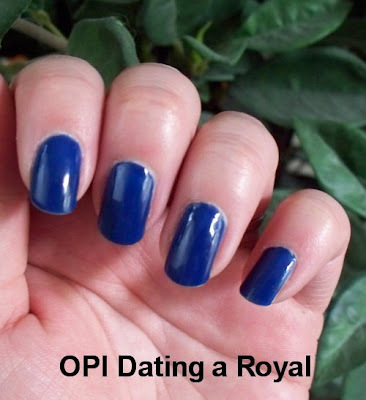 Dating a Royal is a bight primary blue creme. The first time I wore it, I had no trouble finding prints in my wardrobe that matched it perfectly. It is surprisingly wearable on tips , as well as toes, based on this summer's color palette. Unfortunately, when I was wearing it, a friend pointed out that it reminded him of Cookie Monster, and then I kept thinking how much better my hands would look if I had two chocolate chip cookies to hold in them. Not good for the waist line! All of this food talk brings me to a fun use for the new OPI Green-which Village, which is a verdant pea green creme polish. I added it to the top of my I Want Candy manicure for the rind, then used the dark brown shimmery Sally Hansen Salon Haute Chocolate for the seeds of this "funky French" manicure. This nail art would probably look better as a pedicure worn to a picnic with a pair of flip flops. credits: head2toebeauty.com and Melanie Parker. "I Want Candy" lyrics as performed by Bow Wow Wow. Lol, I like your watermelon nails! I would have never thought of that idea. Great nails. I love the bright blue. It looks like a great hue to pop up any outfit. The watermelon nails are fantastic/fun. I might have to try it out sometimes when I'm bored with my usual clear or candy apple red nails. Wow, the watermelon nails are amazing! Very creative. Now I'm thinking of other fruits that would translate well onto nails haha! 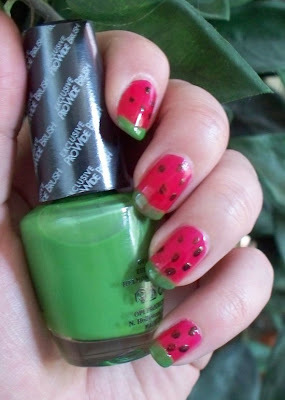 OMG...how cute would the Watermelon Mani look as a pedi? Adorable. Thanks for the adorable idea! just curious- what topcoat do you use (reference to poshe)? is it fast-dry? have you tried others? I've been reading the blog for awhile and I don't remember this topic being covered and I didn't find anything in the quick search. watermelon nails! you can't beat that for a summer look! anon - Yes, I really like Poshe top coat (you can get it with salon polishes or even Sally's Beauty Supply). Based on your Q, I wrote a new article on base and top coats, and you will see it on here soon along with my tip for working with Poshe's thick formula. Thanks for asking! 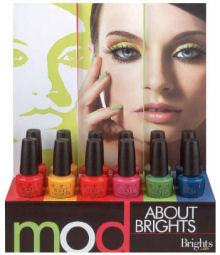 I also chose to buy Dating a Royal and Green-wich Village the day the Mod About Brights debuted, those were the two I thought would be the most flattering on me and most unlike any color I currently owned, but Mod-ern Girl has been on my mind ever since, which was over a month ago. I think I may be forced to surrender and go back to Trade Secret pick up Mod-ern Girl. Ahhh, I love the watermelon mani!!! So cute! Great website blog love the Photo´s and the info.